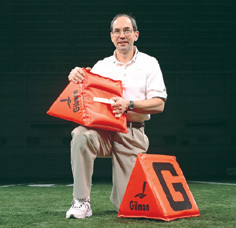 The SIDELINE MARKER stands out on the field. Won’t fold up or blow over because it’s made from a solid foam triangle with a weighted bottom. Bold black numbers stand out against a background of fluorescent orange. Convenient carrying handle at bottom. Stackable for compact storage. Please Call for Estimated Shipping Time & Cost.